The rewarding part of raising hens! Choose a question below to learn more! How many eggs will we get? When the chickens are young you will get about 1 egg every 1 to 2 days. That can be a lot of eggs. For us, with 5 chickens (one being older) we are looking at about two dozen eggs a week. Good thing we love eating eggs and have so many recipes! Oh, and sometimes the girls love to announce to the world that they have just laid an egg! Check out the video of Bertha (at bottom of page) letting us know! What color will the eggs be? The eggs can also come in all shapes and sizes! Check out our video at the bottom of this page where we crack open a jumbo egg! should we wash the eggs before storing them? how do we store the eggs and for how long will they keep? Also, we keep them in a recycled egg carton. We save the egg cartons and reuse them over and over again! what do we do with all those eggs? Eat them of course! We eat them for breakfast, we hard boil them and make egg salad, potato salad and deviled eggs, we add them to fried rice, we love them in a frittata or quiche, and we have even made egg drop soup! We never have a time when we don't know what to do with all our fresh eggs! Don't have backyard chickens? That's OK, but make sure you BUY THE RIGHT KIND OF EGGS. 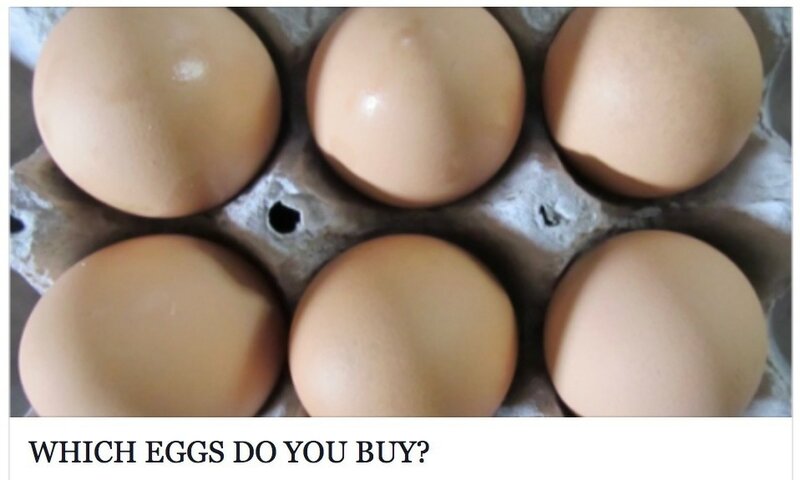 Read WHICH EGGS DO YOU BUY? for more information!